Construction of Brookfield Residential Properties' Portside Wharf development is pushing ahead, with two new residential buildings stretching skywards simultaneously. Pinnacle, is also out of the ground, with work underway on level four. Link, located near the entrance of Portside Wharf, comprises 34 apartments featuring one bedroom, one bathroom and one car space. When complete, Pinnacle will feature one, two and three bedroom apartments, penthouses and River Terraces with a rooftop infinity pool, barbeque and entertainment area, and gymnasium for the exclusive use of its residents. Brookfield Residential Properties Regional Director Lee Butterworth said construction on both buildings was progressing well. "Link will be completed late this year and is set to bring additional retailers to the precinct, with 520sqm of space available for lease on the ground floor," he said. "Construction is also on track for Pinnacle and now that the building has started stretching skywards, people can really see the quality of what we are creating. "Pinnacle will boast a prime absolute riverfront position, with more than 70 per cent of the apartments taking in river and city views and each including high quality fittings and finishes. "These are the most luxurious apartments we've developed to date at Portside Wharf and, with one bedroom apartments right up to luxury penthouses available, they have been attracting strong interest from a diverse range of buyers. "Mr Butterworth said sales at Pinnacle had predominately been to owner occupiers. "We have found the majority of our buyers plan to make the move from a large home in a neighbouring suburb to their new low-maintenance apartment, right on the river," he said. "The apartments themselves include generous balconies to take in the river views and gourmet kitchens that are perfect for entertaining, so whether they want to meet friends at their favourite restaurant, cafe or bar, or have them over to their place, they have the perfect venue. "Mr Butterworth said the proximity to the city and other major amenities was also appealing. "Residents literally have front door access to the surrounding river walkways and bike paths, and are living just six kilometres from the CBD, 15 minutes from the airport, close to the Gateway Motorway and public transport, including the City Cat, making for an easy commute," he said. 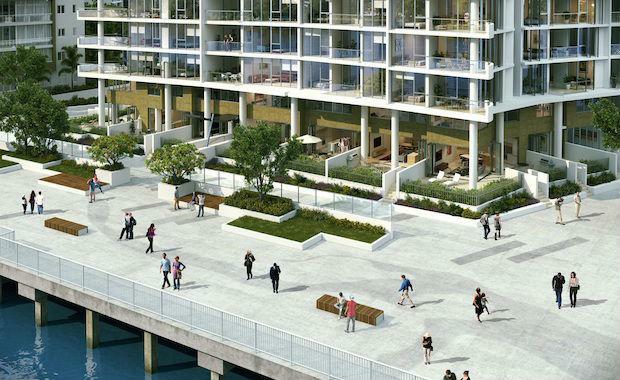 Pinnacle is the fifth residential building to be released at Portside Wharf. The precinct is already home to the completed Promenade, Flare, Infinity and Loft buildings, with Link also under construction.